This is not even a real post, just a request: could you all please learn to spell "Malak" correctly? At least the ones that are going to mosasaurus him. Rami Malek is an actor, not a Sith Lord. You don't that, maybe hes better at hiding his Sith Lordiness than Sidious. Lol I was waiting for this answer. Darth Mercury. The most fabulous Sith Lord of all. With all of the Malik news this is what you choose to focus on? Not that the Malyk event lasts 2 days or that the Malok event requires TWO REVANS. But no the spelling of Malæk is what is important. They are both sith Lords in my heart. This is not even a real post, just a request: could you all please learn to spell "Malak" correctly? Eh. Who cares about Darth Scrublord. At least the ones that are going to mosasaurus him. Rami Malek is an actor, not a Sith Lord. Well, I think that topic is being literally gutted quite enough. I would add my disappointment and toxicity to the train (and I even did to a lesser extent), but I don't think it is necessary or even useful. CG/EA are getting absolutely waterboarded quite since the first Revan came out, but we can arguably say that this started to happen since the first real big paywall, which was JTR. So yes, I will just ask you all to learn to spell a name properly. See, it's not even a criticism. It's somehow even a favour, so you can hide the fact that you don't even know what KOTOR is (not necessarily referring to you in particular though, obviously). Mosasaurus is the next level of whaling. The mosasaurus was a very big aquatic dinosaur, but not so huge as those garbage movies want you to think. Something like 15-17 meters. Oh, and obviously: it's not really a next tier, because blue whales are way bigger than any aquatic dinosaur we know so far, but it can work. Maybe the megalodon would be better with its 18 meters, but it wouldn't still be bigger than a blue whale. We should go with the Amphicoelias, but its lenght (and its very existence) is still theoretical: the guy would have been something between 40 and 60 meters in length, making it the biggest creature ever walking our Earth. Nevertheless, I don't think that "Amphicoeliasing a character" would be handy to use, so I'd go for our monstrous water lizard. So what does a mosasaurus have to do with Darth Mollusk? Well, we all agree that this is a whole new level of whaling. You need to get two whales (the two Revans) and put them together to form a new huge whale, without mentioning the power restrictions, which are laughable means to force you to spend to say the least. So, yeah, I think we need a new term for this. "Whaling" is reductive. Next level up from Whale is Kraken. I thought the term for this was Kracken? Well, yes, the Kraken is someone who whaled out a lot. But it is a quantitative thing. 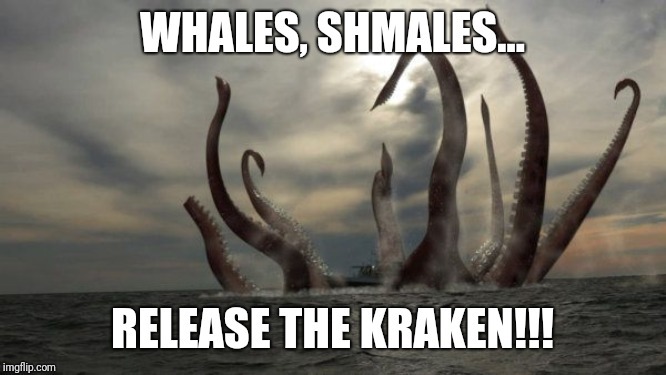 I call Kraken someone that systematically whales absolutely everything, even things they could get for free in more time and that are already free. And also someone who has been whaling since day one of the game. No, this is something bigger all at once. I think we need something more. How is this "two whales"? I thought one of the biggest complaints in the forums just a few weeks ago was that everyone got JKR the second time around and it made the meta stale? Been a whale once, always a whale. And yes, that is true, but I think that nobody was willing to receive such a treatment to fix that. Malek irks me less than the many names of General Grievous. Greivous, Grevious etc. This response makes no sense and in that way it's consistent with the rest of the thread. I'm going to walk away and pretend this thread never existed. This post literally made my eyes roll out of my head. We're learning how to properly use words while learning how to spell at the same time! Take that, video game naysayers! So we are getting Captain Jack Sparrow and the Black Pearl?!?! That's a weird way to spell "Malice", but mmmkuy.